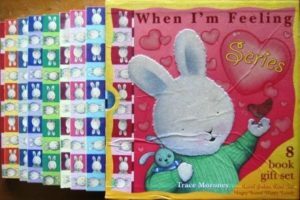 The ‘When I’m Feeling series’ has been carefully designed to help children better understand their feelings and shares examples of ways to express those feelings in a way that is both appropriate and acceptable to themselves and others. Helping our young children develop skills to identify and manage their feelings leads to an increase in confidence, self-esteem, and an optimistic and hopeful state of mind – creating a healthy emotional foundation. Each book includes notes for parents and caregivers.